Systematically covering all the latest developments in the field, this is a comprehensive and handy introduction to metal-metal bonding. The chapters follow a uniform, coherent structure for a clear overview, allowing readers easy access to the information. 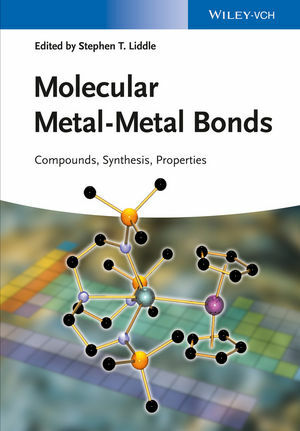 The text covers such topics as synthesis, properties, structures, notable features, reactivity and examples of applications of the most important compounds in each group with metal-metal bonding throughout the periodic table. With its general remarks at the beginning of each chapter, this is a must-have reference for all molecular inorganic chemists, including PhD students and postdocs, as well as more experienced researchers. Stephen Liddle obtained his BSc Hons (1997) and PhD (2000) from Newcastle University. After postdoctoral fellowships at Edinburgh, Newcastle, and Nottingham Universities he took up a Royal Society University Research Fellowship at Nottingham (2007) and was promoted to Associate Professor and Reader (2010). He has been awarded an ERC Starting Investigators Grant (2009, uranium-metal bonds), the RSC Sir Edward Frankland Fellowship and Bill Newton awards (2011), and he was a co-recipient of the IChemE Petronas prize for education and training (2008). He was elected as a Fellow of the Royal Society of Chemistry in 2011. He is Chairman of COST Action CM1006 and was recently elected as a Vice President of the executive committee of the European Rare Earth and Actinide Society. He is a member of the Board of Editors for Philosophical Transactions A of the Royal Society and has published over 100 primary-research and review articles to date.